Ok, so I’m no home expert, but we’ve been living in our newly built home for a few months now and there are some staples we use every single day. A lot of thought went into the design of our home and things we decided to purchase that I was on the fence about, but now I couldn’t imagine living without. This a compilation of those items that if I had to do the whole thing over again, I’d absolutely include or even if we were to go the resale route, things I’d consider to be must-haves. So this is a fairly common item on house wish lists, but there are a fair amount of people who don’t find this necessary. I’ve lived in the city for 10 years without a designated parking spot, so of course I’ve never had a garage. Most people would assume I’d be fine without one, BUT that’s never been further from the truth. Having a garage is pure luxury. When we were looking at resales, we saw a ton of cheaper options without garages and I just knew I didn’t want to go without one. Pulling into my garage every night brings such a sense of security and that true “I’m home” feel. For now, we’re going to try and keep our garage pretty clean so that we can both utilize it to park our cars, but I know as kids come along and accumulate things, this may be harder to do. Until then, I’m going to enjoy not cleaning off my car after a fresh snow or not unpacking my car completely after a long trip for fear of my car getting broken into. Ok, so this is one I never knew I’d care about. While I knew I always wanted an island, I didn’t necessarily think I needed island seating. HOWEVER, after spending a hefty price on our nice RH dining table, we realized that isn’t the most ideal option for messy dinners. We find ourselves posting up at our island more often than we expected because one wipe down and its clean. We paired some super comfortable and functional stools that adjust for different heights and they tie in perfectly with our farmhouse/industrial style. These are from the Magnolia Home line, offered at Gardiner Wolf. GW was super helpful to work with when I was indecisive about what style to go with for our kitchen. I took a scroll through their online site in addition to going in store to speak with a consultant. Because we have our dining table in the same space, I was worried about clashing, but I think we found the perfect set. Don’t forget to click here for $50 off your purchase of $499+! This is another one I always dreamed of having, but when we were in our design phase, it started to become more of a ‘luxury’ than a ‘must-have’ due to price, but now I’m totally retracting that and adding it to the ‘must-have’ list. The amount of baths I’ve taken in three short months instantly make it worth it. If you’re even remotely into taking baths, I absolutely recommend a soaker tub, you won’t regret it. Now all I need is one of those tub caddies, complete with a glass of wine. During the design phase of building our home, we toyed with the idea of leaving our basement unfinished with the thought that we’d save a little money and get it finished on our own. I am so glad we didn’t do that. Seeing how hard even small projects are for us now that we’re so busy and we have the baby coming, I guarantee that basement would’ve remain unfinished for quite some time. Having the additional space for guests is so nice. We have an unfinished part for storage that allows us to close it off so we aren’t constantly staring at clutter. Although we do still have some boxes and things to find homes for. Any of you who were following me while we were building our home knows the struggle I had with deciding whether we’d do the double oven. I can say 100% hands down I am thrilled we went with the double oven. We worried we’d only get use out of it on holidays, but I’ve already used it countless times and we’ve really only entertained once or twice. I constantly ask myself how people manage without a double oven. I know most people don’t have this luxury, but to me theres been several times I’d be in a pickle without it. If you’re on the fence about it and have the ability, I say go for it. It just makes life easier. Even if I’m just baking cookies, I can throw 4 sheets in at a time, instead of waiting for 2 sheets to bake, cool and then put the remaining in the oven. Anything that saves me time is worth the money. So we didn’t have much of a decision about this during the design phase because they automatically put the washer/dryer upstairs near the bedrooms, but when we were looking at resale, a good amount of the houses we liked had them on the main floor or the basement. I remember always hearing my mom say that having them upstairs is a lifesaver, but I’ve never had that luxury, so I didn’t bother worrying about it. However, now living with them upstairs, it truly is a lifesaver. Especially being pregnant and getting winded so quickly, its a god send to not have to run two floors every time I need to throw laundry in or take it out. Ok, this is another one that my mom always said was a lifesaver. Again, never had it, never thought I needed it. During our design phase, we decided to add a line to the garage that allowed us to eventually add a second refrigerator. Well, I decided after two weeks in the house that we NEEDED a second refrigerator. Now that we were cooking so often and I was meal prepping weekly, I thought we could use the extra space. Then we had our first party and holy sh*t did I find out just how necessary it really was. I’m not sure what we would have done without that for trays of food or drinks. And in everyday life it frees up so much space in your main refrigerator so that it stays free of bulky items like beer, wine and la croix, so that it stays clean and organized. So this is one that Will and I didn’t even want. My mom was very adamant about us adding this option after she saw it in the model home. We didn’t even decide to add them until the very last minute because we saved money elsewhere and now I know we both LOVE them. It allows us to turn on a small light at night without lighting up the whole house just to go up or down the stairs and with an open concept, this has been awesome. I imagine it’ll be even more beneficial for nighttime feedings with the baby. Definitely a “luxury” item, but so happy we decided to add them. Ok, so the theme of this post is “I really didn’t think we needed this, until now” and the same goes for the Roomba. This little robotic vacuum has been a game changer. With so much open hardwood space and two very furry kitties, we see everything. I usually set the Roomba up to vacuum while I’m out and coming home to freshly clean floors without having to do anything other than press a button is a feeling like no other. The other day the Roomba was charging after vacuuming upstairs (yes, we take it up and down to get maximum use out of it), so I had to use our real vacuum and it was the first time I took it out in three months of living here. That’s HUGE. They are 100% expensive AF, but absolutely awesome. I love the one we have – here – with the wifi because I’m able to get notifications to my phone when it needs to be emptied or it gets stuck and I can start the cleaning while I’m out. Another struggle I had when we were designing our house was where I was going to put the litter box for the cats. I didnt want this noticeable, so I toyed with the idea of putting it in a closet and cutting a hole in the closet door, putting it in the basement and always leaving the door cracked, putting it in our laundry room, but all of these ideas had flaws that I wasn’t willing to settle for. Then Will found this Litter Box Disguise and I love it. 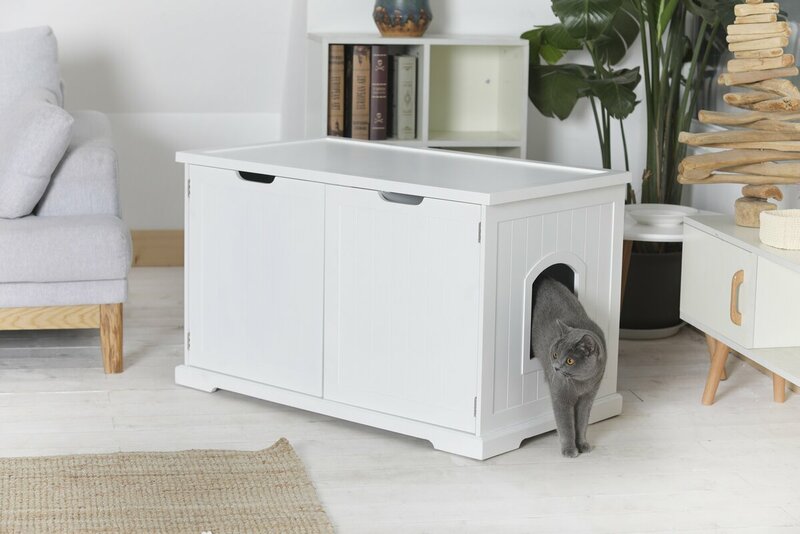 It isn’t the prettiest piece of furniture, but it looks 100% better than having an exposed litter box. This isn’t our kitty, but you see how well it blends in to a furnished room. Serious game changer.